Lemurs are "the world's most threatened mammal"
The destruction of their tropical forest habitat and an upsurge in hunting has been blamed for depleting lemur numbers. LEMURS, THE FURRY apes brought to fame by the Disney animation film Madagascar, are the most endangered mammals on Earth, an International Union for Conservation of Nature conference found. An IUCN workshop met in Madagascar this week to discuss the world’s 103 lemur species as conservation deteriorates amid political turmoil that has lasted three years. Madagascar has, by far, the highest proportion of threatened species of any primate habitat region or any one country in the world. As a result, we now believe that lemurs are probably the most endangered of any group of vertebrates. Over 90 percent of the world’s lemur species — found only on the Indian Ocean island — were upgraded to critically endangered, endangered, or vulnerable on the IUCN’s Threatened Species list. The destruction of the primates’ tropical forest habitat and an upsurge in bushmeat hunting have depleted lemur numbers since conservation efforts broke down after a coup in 2009, the body said in a statement. Following this coup, there has been a serious breakdown of protective measures, with two key protected areas in northern Madagascar, Masoala National Park and Marojejy National Park, both of them part of a UNESCO complex of World Heritage Sites. It found that “political uncertainty has increased poverty and accelerated illegal logging. Hunting of these animals has also emerged as a more serious threat than previously imagined”. The bush meat trade also affected tortoises and other species. Madagascar’s lemurs represent 20 percent of all primates, concentrated in an area less than one percent of global land area where apes roam. 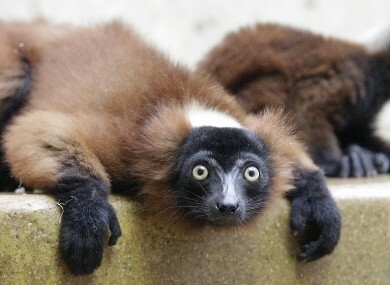 Email “Lemurs are "the world's most threatened mammal"”. Feedback on “Lemurs are "the world's most threatened mammal"”.